Beatles - John Lennon / Yoko Ono Double Fantasy RIAA Platinum Album Award Presented to Lennon (Geffen GHS 001, 1980). The last studio recordings released in John Lennon's lifetime were included on Double Fantasy, created in collaboration and full partnership with his wife Yoko Ono. The couple had begun the recording in the late summer of 1980, in secret and without having signed with a label. After they were were satisfied that the content was strong, their publicist leaked the news and they were immediately inundated with offers from all of the major labels. David Geffen had only launched his namesake label that same year, but he purportedly sealed the deal for Double Fantasy by approaching Yoko first, assuring the couple that he considered her contributions as equal to John's - even before Geffen had heard any of the recordings. The LP went on to win the 1981 Grammy Award for "Album of The Year". According to the plaque beneath the platinum disc, this award was presented to "John Ono Lennon" in commemoration of over a million sales. Framed to 17" x 21". In Fine condition, with some scratching/scuffing to the frame. 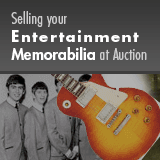 From the Connie and Dennis Dailey Monumental Beatles Collection.